Indeed, scores of groggy undergrads in my line of sight were gripping small flat devices I mistook for cell phones, but were actually clickers. When the professor displayed the question on a 50 foot screen using Power Point, this chemistry mega-class was absolutely silent, all heads pointed to the front of the room. When he instructed, “Ok, enter your response,” all 500 heads tilted downward in unison, followed by 500 thumbs pressing buttons on their clickers. With the command, “Ok, now turn to your neighbor and try to convince them of your answer,” mass chaos erupted. Or so I thought it was chaos. When I walked around the room and actually paused to listen to students, every group I approached appeared to be wrestling out loud with the subject matter, questioning each others’ reasoning, gesturing enthusiastically with their hands as teachers do to explain to each other what they thought was the correct answer and why, with tons of chemistry jargon peppering their conversations. Cynthia LaBrake, who teaches general chemistry at the University of Texas, Austin has an enrollment of 410 students this semester. LaBrake and her colleague David Vandenbout recently started using Peer Instruction along with some other interactive teaching activities, helped along by clickers. Peer Instruction flips large-enrollment classes like LaBrake’s by moving information delivery or transmission (i.e. content coverage) out, and information assimilation (i.e. content un-coverage) in. Ed Prather, an award winning astronomy professor at University of Arizona, is well known in the physics and astronomy community for interactive teaching in mega-courses. Prather uses the “think-pair-share” model inherent in Peer Instruction to engage all students,not just those who have the courage to answer or ask questions out loud in front of hundreds of their peers. How does he do it? Prather creates “conceptually-rich” multiple-choice questions, either before class or on the fly. He poses the questions to students, and asks them to think about the question for a few minutes. To solicit first votes, Prather uses a low-tech audience response system: color-coded ABCD paper flashcards. Based on his assessment of first-vote results, he encourages students to discuss their answers. After a few minutes, he solicits a final vote, again using the flashcards. Prather describes research on his approach and its links to learning outcomes in Using Research to Bring Interactive Learning Strategies into General Education Mega-courses. Explicit instructions, including exactly what Prather actually says to students, are available from the Center for Astronomy Education. Rick Sellens, a professor at Queens University in Canada uses Peer Instruction in his Fluid Mechanics class, which has 209 students this term. 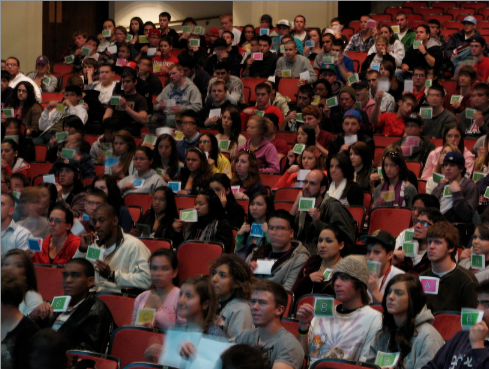 Despite the large enrollment, Sellens says: “I was able to get students engaged and talking to each other about subject matter using Peer Instruction.”Sellens doesn’t use flashcards or clickers (although he has tried them) because he prefers to use rich-answer type formats that go beyond multiple choice, mostly he says, because he finds it difficult to create good multiple choice questions. What strategies do TTYN readers recommend? I like the beneficial info you provide in your posts. I will bookmark your blog page and check out again here frequently. I’m quite sure I will learn many new things right here! Best of luck for the next!